What a vision! 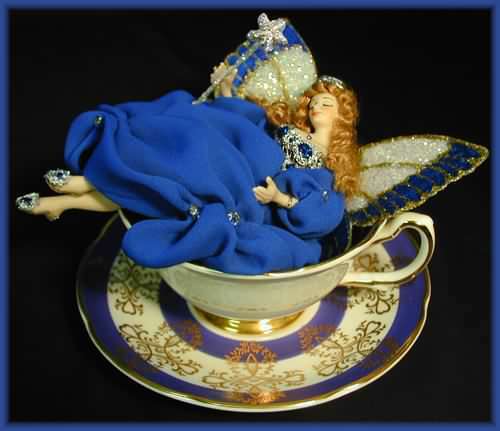 Is anything sweeter than a sleeping fairy in her own tea cup? Let's not awaken Fairy Princess Ceylon. 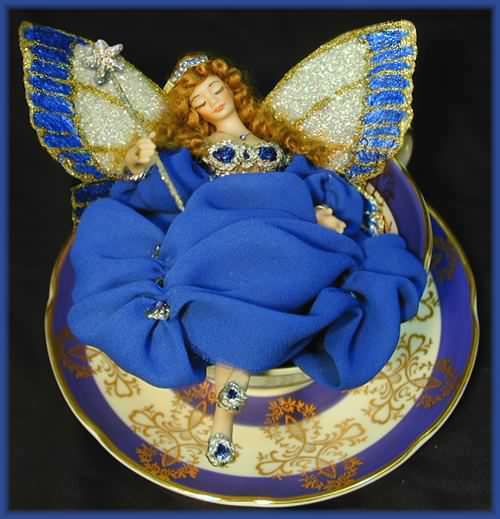 She is resting in her fancy hand-made ball gown of blue georgette with matching pantalettes. 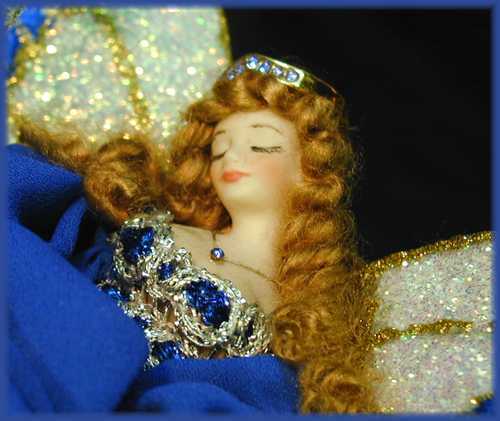 Her bodice is an exquisite blue and silver ribbon. Her "theme" is gold, however, to match her gorgeous china tea cup which is hallmarked "Royal Grafton Fine Bone China" (from England). The inside of the tea cup is trimmed in blue to match the saucer. What you don't see are the delicate roses in the center of the saucer, as well as in the bottom of the cup. But back to Princess Ceylon - her hand-made, hand-painted wings pick up the blue of her dress and the gold trim of her cup. She sports a wearable fashion ring as her crown. She is adorned with delicate fairy jewelry, of course, consisting of her necklace, 2 bracelets and 2 rings. Even asleep she holds on to her glittery star wand. Note her matching tiny "slippers" on her fairy feet! Fairy Princess Ceylon is approx. 5.5" tall and has a wingspan of 5". Her cup is 2.5" tall and her saucer is 5.5" in diameter. Like all JoAnnJ creations, she is a one-of-a-kind work of art and is signed by the artist. She comes with a signed certificate of authenticity.